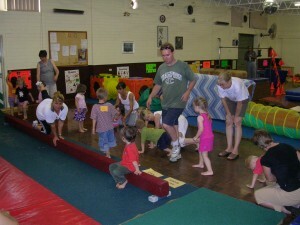 Kinder-gym is lots of fun for everyone, parents, children, grandparents and caregivers. Kinder-gym is a play environment which stimulates children to use various motor functions to climb, roll, glide, throw, kick, crawl, run, jump and swing. 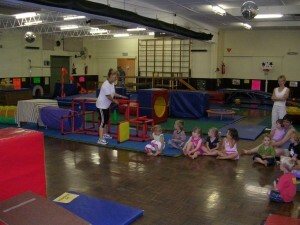 It is like an indoor playground with play and gymnastic equipment and offers safe, exciting new challenges for children. Equipment includes trampolines, swings, slides, beams, climbing frames, tunnels, ball, hoops, boxes, roman rings and a variety of toys and other play equipment. 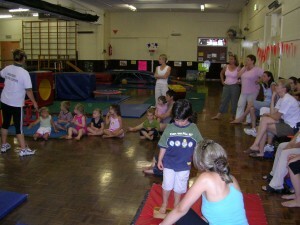 The 45 minute classes are run by a fully qualified accredited Level 1 Kinder-gym Leader. Classes are held during school terms. Children are to wear non-restrictive clothing and have bare feet. The Kinder-gym Leader conducts, encourages, assists and provides support for all children and adults. Children are not pressured to conform or perform, but rather encouraged to try, imitate and join in to the best of their ability.